The Covidien Curity™ Abdominal Pad is made with a soft, non-woven top layer for patient comfort and fluff filler for maximum absorbency. The Covidien Curity™ Abdominal Pad is made with a soft, non-woven top layer for patient comfort and fluff filler for maximum absorbency. All four edges are sealed to prevent lint residue and leaking. 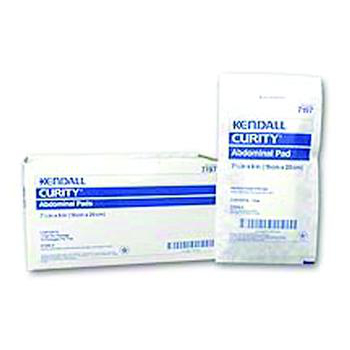 Convenient sterile or non-sterile packaging; sterile pads are sealed in a single peel-back sleeve. Blue stripe indicates which side goes up: "Blue to the sky". Ideal for multiple applications including heavily exuding wounds, padding for pressure points, or anywhere high absorbency is needed. Size: 5" x 9", 7.5" x 8", or 8" x 10"
Quantity: 36/box for 5" x 9" // 18/box for 7.5" x 8" // 4 for 8" x 10"
* Shipping may take longer than normal.